dried white peas recipes, safed vatana recipes. Safed vataana are also known as dried white peas. These peas, unlike the green peas, are available all year round. They are nothing but mature peas that are harvested and then dried. As the name suggests, these are off-white, yellowish in color. The white peas can either be whole or split and both have to be soaked in water before cooking. In India they are used many a times when fresh green peas aren’t available. Even though most famously used for Maharashtrian recipes, these dried peas can be a replacement for green peas in many recipes. One of the most popular street foods of Mumbai, Ragda Patties, uses dried white peas as one of its main ingredients. This dish is made of two parts – the soft patties and a rich, spicy Ragda. This ragda is only made with the dried white peas, cooked with tamarind, jaggery and spices and has a luxurious mouth feel. The streets of Delhi serve up the Dahi Ragda Chaat in which the ragda is the main component, served up with some cold dahi, spicy and sweet chutneys and crunchy sev to top it. The mixing of cold and hot makes this dish very fun and unique to eat. Misal pav is also a popular dish in Maharashtra. It consists of mixed kathol (different sprouts and legumes) cooked in a very spicy masala and topped with farsan and raw onions! In the eastern states of Assam and Bengal, safed vataana are cooked with a traditional eat Indian gravy to make Ghugni. This snack is extremely famous, especially throughout Kolkata and is unique because it is served with puffed rice and onion pakodas on the side. 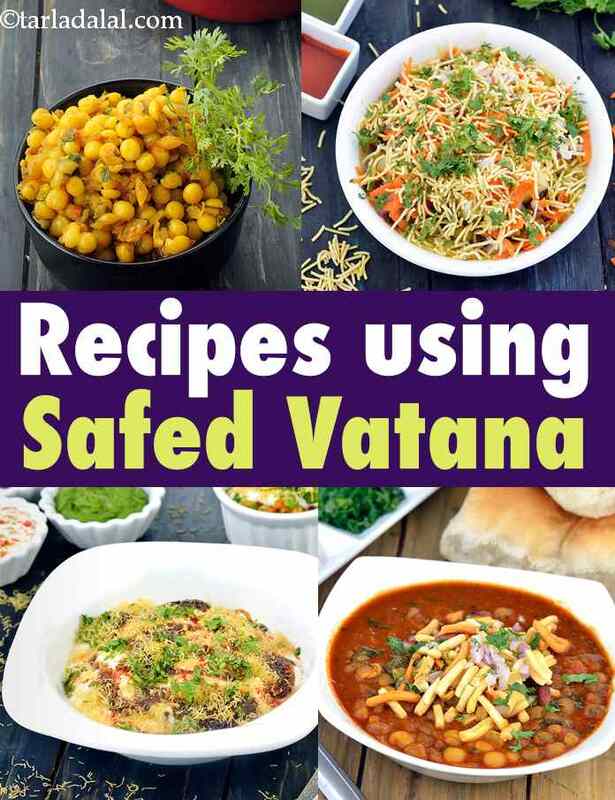 Enjoy our dried white peas recipes, safed vatana recipes given bleow. Ragda made from soaked and boiled white peas, tempered with mustard seeds and asafoetida, serve it as a stuffing with pani puri. A favorite Maharashtrian snack recipe, missal pav is basically the sprouts cooked in a spicy rich curry and served garnished with chopped onion, chillies and coriander leaves with pav or Indian bun. A complete meal in itself, the missal pav is loved by all. A popular spicy street food found in Mumbai,Ragda patice is potato based patties served with hot spicy ragda(white peas preparation). Top the Ragda pattice with chopped onion, chillies, imli chutney and sev to enjoy a favorite snack recipe. The street food king,Ragda patice is a popular chaat or snack item available on the streets of Mumbai. The pattice is made from boiled and mashed potatoes and served with hot spicy ragda (white peas preparation). Top the aloo pattice with hot ragda, chopped onion, chillies, imli chutney and sev. Get a complete package of proteins, calcium and taste with the mouthwatering Three beans curry. The rajmah beans,moong dal and white peas are cooked together in a delicious spicy and tangy curry. Relish the three bean curry with rice. Step up the fiber and nutrients in your diet with this delightfully tasty and healthy lalhari paushtik dal. The white vataana or pea are cooked spinach, grated beetroot and spices. Serve this appealing dal hot with rice or roti. To avoid the heavy makhni dal because of the cream, this dal gives excellent taste, better than makhni dal. One can also avoid desi ghee and go for oil. Beans vegetable soup is a protein packed and delicious mixed vegetable soup with a range of vegetables added together with boiled beans. A tongue tickling Jhat-pat chaat recipe with boiled peas tossed with kabuli chana, white peas, sprouts boiled and fried potatoes and select chutneys and seasonings. Jhat-pat chaat recipe with boiled chana,green peas, moong sprouts and potatoes tossed together with a sweet chutney and a green chilli sauce. A super south indian dish prepared during Inam festival in kerala.